Violin Maker's Wife: What Wood is a Violin Made of? 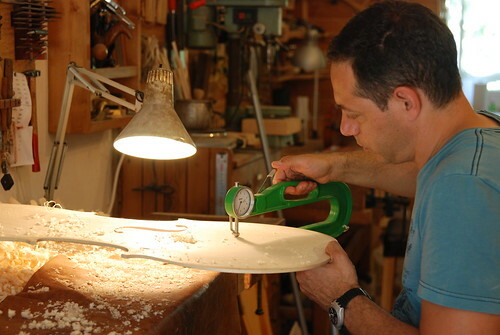 As I mentioned in one of my previous posts, this is usually the first question people ask about making a violin. The answer is actually rather interesting and I have found that even musicians who play stringed instruments are often unsure exactly which types of wood their instrument is made of. Well, it’s like this: almost the entire instrument (and this is true for the whole Quartet), is made of a special maple wood, called “flamed” or “tiger” maple, that grows mostly in the Balkans. 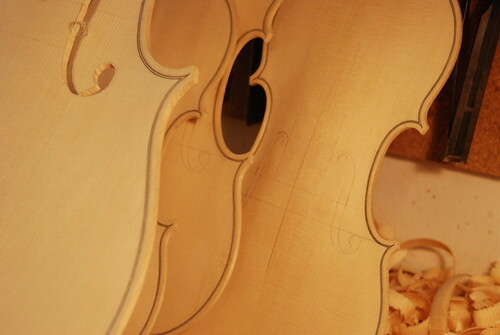 This is the single trunk that I told you about; the one that Yonatan hand-picked in order to build the entire quartet from; the one that got my romanticism-glands flowing and got me started on this blog. This maple trunk is used to construct the instruments’ backs, ribs and necks and has an especially beautiful grain that looks like flames, or waves, or tiger stripes (wait till we get to the part of the varnish, then you’ll see some really beautiful pictures of this!) Anyway, this is what most of the violin is made of. The soundboard, or “belly”, of the instrument is a different issue entirely. It’s made of a radial cut (like a fat pizza-slice) from a special spruce tree which, as I briefly mentioned once before, is professionally-selected from the wild forests of the Alps, where the trees have to face harsh weather and compete for scarce sunshine and thus grow just a bit every year. As a result, the “rings” of their trunks are tight and close-together, making the wood lighter (as in less-heavy…) and more resistant. 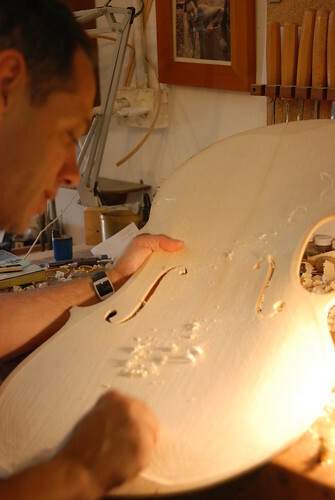 This spruce is then used to construct the soundboard as it has very special flexibility and vibration qualities – it’s basically what makes the violin sing. Why am I explaining all of this? Well, just to say that last week Yonatan finished the spessori (“thicknesses”) phase of the four backs of his (our?) Quartet, and this week he has been working on carving out the wood from the first soundboard, that of the cello, which is a completely different matter. … and repeating this sequence a few dozen times … until the right thicknesses are reached throughout the soundboard. I stopped by the workshop the other day and saw that he was almost done with the soundboard of the cello (so credit for the last three pictures goes to me this time around:)…) Yonatan explained that he is currently at the point in which the thicknesses of the four backs have been completed and the “f‘s” were drown on all four soundboards. He said that at this point he must leave the “Quartet View” of things for a while and focus on each instrument individually. 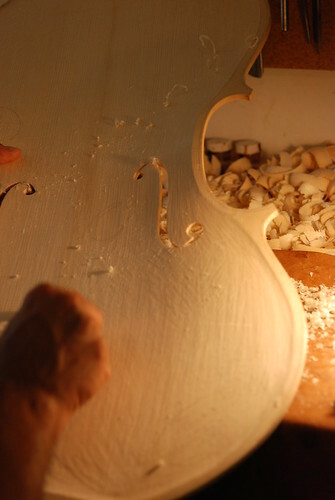 So now he basically finished carving out the “spessori” and cutting the “f‘s” of the cello and he will continue working on it until the cello’s front and back have been glued to the sides and the body of the instrument (called “cassa“, or ‘box’ in Italian), is closed. I guess like in any good relationship, sometimes it’s important to distance yourself from the “family”, so that you can develop on your own and come back together in a much better, more complete shape… How is this “violin-analogy-popular-psychology” for you?! ?